1 .Technique of easy ways of drawing. 2 .Colour and Shading technique. 3 .Composition of a drawing. 4 .Proportion of a drawing. After school program: Types of drawing, Perspective drawing, Design, Shading, Colouring, and Painting. Week End program: Portrait drawing, Life drawing, Still Life drawing, Craft etc…. 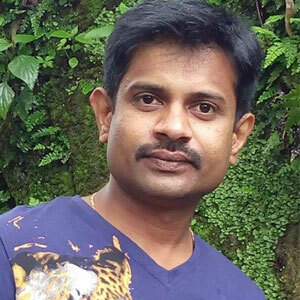 Mr. S. Harish Kumar, Visual Art faculty at KENSRI, is a graduate in BFA , A.Ed, and has over 6 years of experience. He is an artist, specialized in Paintings, Portrait, Caricature and Crafts. He has been exhibiting lot of shows in ChitraKalaParishat since 2008. Many Students have successfully competed in interschool Competitions (NIE, ISCKON etc. ) and have won many prizes. Developed props, banners, charts, greeting cards, cut-outs for all the events of the school. An yearly Exhibition – “KENSRI Banna” is held where students exhibit their visual art skills.